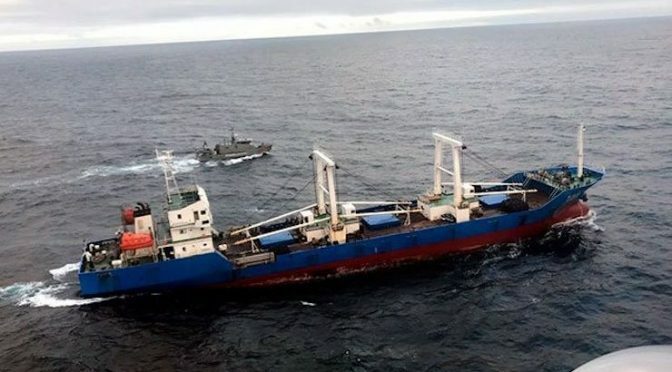 The most recent incident occurred on 13 August when an Ecuadorian Coast Guard vessel and a supporting helicopter detained the Chinese vessel Fu Yuang Yu Leng 999 within the Galapagos Islands Marine Reserve. The vessel was escorted to Puerto Baquerizo Moreno, where an inspection discovered over 300 tons of a variety of fishes, particularly hammerhead and silky sharks as well as other endangered species. The vessel was a factory ship, which was fed fishes that were caught by other vessels. The country’s Ministry of Defense has stated that the Chinese fleet operating around Ecuador may number as many as 300 vessels. The incident prompted non-violent protests in front of the Chinese embassy in Quito as well as in Santa Cruz Island. At the time of this writing Ecuadorian authorities have put the crew on trial and have also sent a letter of protest to the Chinese government. Previous to this case, the most notable illegal fishing-related incident in the region (so far) occurred in Argentina last year. In March 2016, the Argentine Coast Guard located a Chinese fleet fishing in its territorial waters by Chubut, southeast of the country. Security vessels were deployed, and the Coast Guard shot at the vessel Lu Yan Yuan Yu to prevent it from fleeing to international waters. Rather than stopping, the Chinese ship tried to ram one of the vessels. Argentina Coast Guard footage of Chinese fishing vessel Lu Yan Yuan Yu in March 2016. There have been other incidents in the past couple of years involving Chinese fishing fleets. A final example occurred in 2015, when the Chilean Navy stopped a number of Chinese vessels off the Bio Bio region in Chile’s exclusive economic zone. The concern was that they were fishing for shrimp. An 11 July 2015 Navy press release explains that said vessels were inspected and no illegal cargo was found. In December 2016, the Peruvian media reported the presence of large fleets from Asian nations (China, Korea, Taiwan). Similar articles explaining how these fleets hurt Peru’s fishing industry were also published in May to continue to raise awareness among the population. It is important to stress that apart from the 2016 incident in Argentina, there have been no other reports regarding violent maneuvers by Chinese fishing vessels when in contact with Latin American security forces (at least none that the author could verify). Leaving aside the governmental response to these incidents, regional naval security forces now must demonstrate that they are capable of monitoring and controlling their nation’s territorial waters. For example, after the Galapagos Islands incident, the Ecuadorian Navy carried out naval exercises aimed at combating transnational maritime crimes. The 209/1300 submarine Huancavilca participated in the maneuvers, along with three coast guard vessels and a helicopter. A civilian fishing vessel and crew were also utilized as the target for said maneuvers. Days after the exercises, the Ecuadorian media reported that Huancavilca had departed for the Galapagos Islands to help with patrolling the area against illegal fishing activities. It is also worth noting that Ecuador and other nations are obtaining new naval platforms, particularly offshore patrol vessels (OPV), to monitor their maritime territory. For example, IHS Jane’s has reported that on 31 July the Argentine government passed a decree “authorizing state credit to finance some of the major defense acquisition programs included in the 2017 budget.” The acquisitions program includes OPVs, Beechcraft T-6C+ Texan II aircraft, among others. It is unclear if the OPV acquisition was motivated by the 2016 incident, but it stands to reason that this incident provided even more evidence that the Argentine Navy requires new platforms for maritime control. Discussing unauthorized Chinese fishing is complicated as alarmism must be avoided. The incidents between Chinese fishing fleets and security forces in Latin American waters have been few – at least from what has been reported. And apart from the 2016 incident in Argentina, none other has been violent. Nevertheless, there are a plethora of reports regarding Chinese fleets operating without authorization in Latin America and other parts of the world, particularly in Africa: just this past June, Senegal detained seven Chinese trawlers for illegally fishing in its waters. Moreover, it is correct to assume that these fleets will continue to attempt to operate in Latin American waters in the near future, particularly as domestic demand for maritime resources prompts them to be bolder when it comes to the areas that they travel to. It is also important to mention that not all the fish China captures are for internal consumption, as the Wilson Center’s report “Fishing for Answers” explains: “most of China’s high-value species and about half the overall catch are exported to the EU, the United States, and Japan, and the other half is brought back to China and sold domestically.” (While this article is focusing on illegal fishing by Chinese fleets, we must keep in mind how growing global demand for fish is affecting the fishing industry in general). Thus one concern looking toward the future is whether there will be more violent confrontations between illegal fishing fleets and security forces given a growing demand for maritime resources. So far, the vessels have either attempted to flee or surrendered to authorities, but the Argentine incident raises the question: would some of these crews one day decide to fight back in order to avoid capture and protect their profit? Finally, the possible ramifications of future incidents like this must be considered. China is a global economic force, and most nations, including developing nations such as those in Latin America, would not want to take Beijing head on. This is arguably the reason why the incidents mentioned in this article have not somehow evolved into some type of trade or diplomatic crisis. In fact, just this past March, the Argentine government signed a memorandum of understanding with the Chinese company Ali Baba to sell products like wine, meat, and (somewhat ironically) fish. Similarly, in spite of the December 2016 reports about the Chinese fishing fleet in its territorial waters, Chinese-Peruvian trade remains strong as the latest data by the Peruvian government states that trade grew by 30 percent in the first half of 2017 compared to the same period last year. How Ecuador reacts to this latest incident will be interesting as Quito-Beijing ties are not only strong due to commerce but also on other areas. For example, Ecuador has acquired “709 4×4 and 6×6 multipurpose trucks, 6×4 fuel and water trucks, and different types of buses in a deal reportedly worth USD81 million,” according to IHS Jane’s. On 4 September, Ecuador’s daily El Telegrafo reported that China’s Ministry of Agriculture has proposed the establishment of an “intergovernmental communication mechanism” between Quito and Beijing to “exchange information and jointly protect” maritime resources and crack down on illegal fishing activities. At the time of this writing there have been no reports about how the Ecuadorian government will respond to this proposal but, if previous incidents in other countries are a precedent, the Galapagos Islands incident will probably be minimized in order to protect Quito-Beijing partnerships in other areas. Demographic growth and scarcer maritime resources are a catalyst for more frequent clashes at sea. In recent years there have been various reports about Chinese fishing fleets operating in international waters and also crossing into a country’s maritime territory to carry out unauthorized fishing activities. The most recent August incident off the Galapagos Islands is another example of this problem, one which has gained prominence in Latin America since the March 2016 incident in Argentina. New platforms like OPVs will help regional navies to more efficiently patrol their maritime territory and intercept unauthorized fishing fleets in the near future; however this is just half of the equation. The second part is how Latin American governments will adapt their relations (particularly trade) with China since most violating fishing fleets appear to be Chinese. Combating illegal fishing is a complex issue, as it involves modern (and numerous) platforms for surveillance and interception, as well as a skilled judicial system to prosecute the culprits. Adding the future of a country’s relations with China will not make the problem any easier. Featured Image: Ecuadorian Navy photo of intercept of Chinese fishing vessel FU YUAN YU LENG 999. That’s why I think in Central America and South America, you see a prime market for SSK Submarines, Patrol boats, OPV’s Corvettes and frigates to do this kind of work. It’s why I would not be shocked if the Market for SSK Submarines, Patrol boats, OPV’s Corvettes and frigates explodes in Central America and South America in the next 10 years.